Retirement Online Website for Retirement? I am eligible to retire for four years now and just can't seem to walk out that retirement door! I am a Retirement Manager for local government... and wanted to use my retirement knowledge to help others after I retire -- thus Retirement-Online.com was born in 2007. I love every minute I spend on my site... answering questions from strangers far away, and helping them! 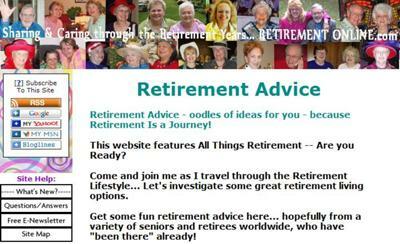 I have to say I also LOVE the topic of retirement... so I selected this huge niche for my website. If I wasn't passionate about my niche, it just wouldn't work well, knowledge or not. I use SBI (the same as this website owner uses) -- that, in my humble opinion, is the key to growing a business on the web... not just a website, a real business. Try building your own online website. Wouldn't it be great to have your own business when you retire? You won't be disappointed! Overwhelmed at first, yes... Disappointed, never!